More power, more performance, and more high-quality entertainment – with the Intel Core i5 processor, you get more of what makes a computer great. Are you amazed by the things you can do with your computer? If you bought your computer more than a handful of years ago, you're missing more than you know – uncompromised gaming, while you stream, chat and share with your community – stunning visuals of Ultra HD 4K HDR premium content – transport into a great VR experience. With premium performance and new and enhanced features, a desktop computer based on a 7th Gen Intel Core processor is always ready for real-life productivity, creativity and entertainment. 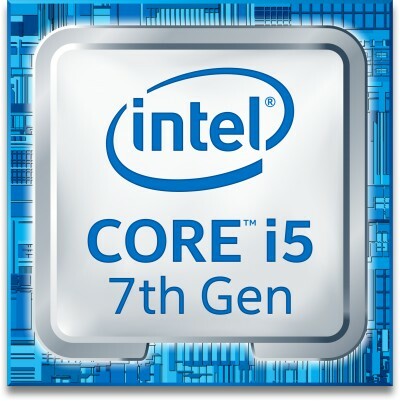 With a range of smart, stylish designs and sizes, there is a 7th Gen Intel Core processor-powered desktop computer to fit a wide range of budgets and needs. To play premium movie streams in stunning Ultra HD 4K, you’ll need a computer that supports the latest media technologies. Desktop computers based on the 7th Gen Intel Core processor can support the latest media technologies required to enjoy premium high-quality content. 7th Gen Intel Core processors offer hardware-level security features that strengthen the protection of your enabled security software. Hardware-based security helps you compute with greater peace of mind. Play HD videos with exceptional clarity, view and edit even the smallest details of photos, and play today’s modern games. Visual quality and color fidelity enhancements for HD playback and immersive web browsing. On select products, CPU/graphics and memory can be run at frequencies above the rated frequency of the part resulting in higher performance. TSX-NI is a set of instructions focused on enterprise-level multi-threaded performance scaling, making parallel operations more efficient via improved control of software threads and locks. This offers performance benefits for enterprise-level big data analytics/business intelligence and visualisation apps, which involve multi-user collaboration. Available on the Core i7 and Core™ i5 processors with Intel vPro technology and unlocked processors. AVX 2.0 is an extension of AVX 1.0 with new optimised instructions to deliver enhanced performance on floating point–intensive apps. AVX 2.0 adds 256 bit integer instructions and new instructions for FMA (Fused Multiply Add). FMA delivers better performance on media and floating point computations, including face recognition; professional imaging; high-performance computing; consumer video and imaging; compression; and encryption. Intel BIOS Guard is an augmentation of existing chipset-based BIOS flash protection capabilities targeted to address the increasing malware threat to BIOS flash storage. It protects the BIOS flash from modification without platform manufacturer authorisation, helps defend the platform against low-level DOS (denial of service) attacks, and restores BIOS to a known good state after an attack. Hardware-based boot integrity protection that helps prevent unauthorised software and malware takeover of boot blocks critical to a system’s function, thus providing added level of platform security based on hardware. Configurable boot types include: Measured Boot and Verified Boot. Offers up to 8 GT/s for fast access to peripheral devices and networking with up to 16 lanes. PCI Express ports can be configured as x1, x2, x4, x8 and x16 depending on motherboard designs. “Conflict-free” means “DRC conflict-free”, which is defined by the Securities and Exchange Commission rules to mean products that do not contain conflict minerals (tin, tantalum, tungsten and/or gold) that directly or indirectly finance or benefit armed groups in the Democratic Republic of the Congo (DRC) or adjoining countries.